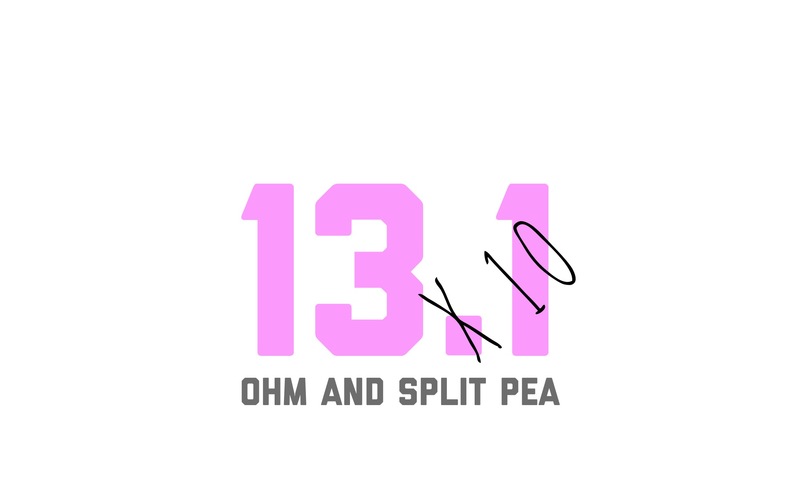 A couple of weeks ago, I was on a long run and began contemplating my audacious goal: 13.1×10. 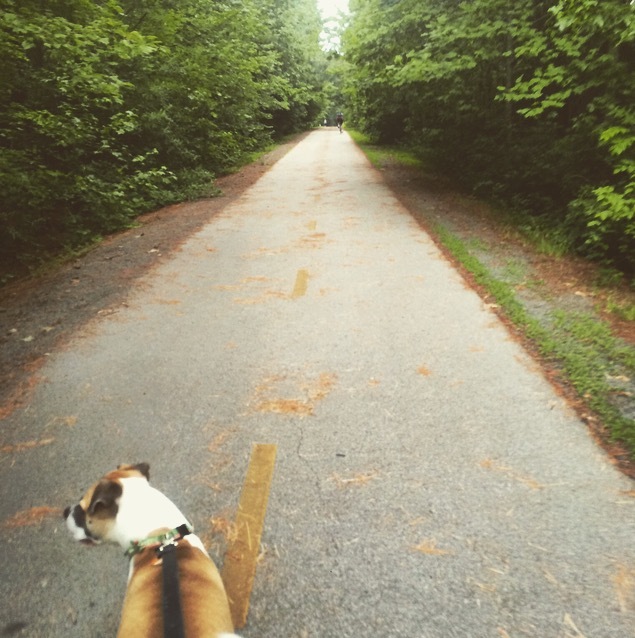 I go through many inner ramblings on my runs (a big reason why I consider running to be my Meditation in Motion). I wanted this goal to be big…to have a true impact on not only myself, but the local and global community. So, I decided I’m running for elephants and education. I’m very much so a “big picture” kind of person. I have to really focus when it comes to narrowing down the details. 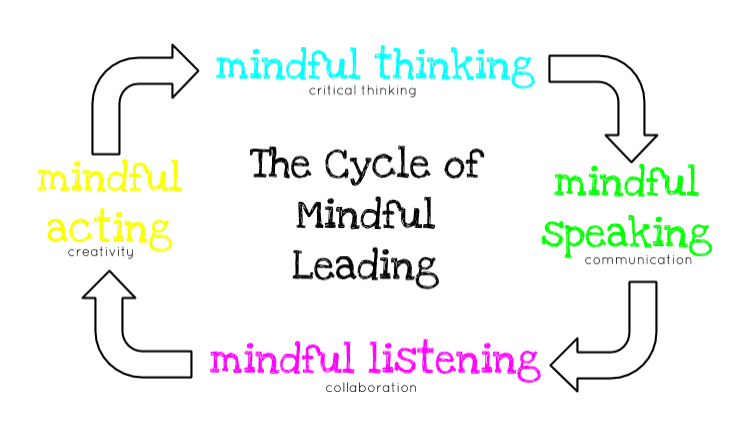 To do this, I practice what I preach to my students and follow what I like to call the Cycle of Mindful Leading. It allowed me to organize the thoughts around me and to make the details more clear on this new, exciting goal. I created this cycle to guide my students in building their awareness. Using this cycle allows for us to build our self awareness. Once we have self awareness, only then can we have peer awareness. From there, we can work together to have community awareness. Communities can come together to build global awareness. I am privileged in having the opportunity to not only my basic needs, but to an endless amount of possibilities. Running not only creates the space for me to build this awareness but it is also one of the many privileges I am fortunate enough to have in my life. I am aware that I want to use my privilege to help others meet their basic needs. Now that I am aware of the thoughts around me, I can communicate that I want to run races to support local causes. While running can help locally, I can do more to help globally. Shoes are not only a privilege that take me on all my running journeys, but they provide me with an overall daily wellness as I walk all over. People all over do not have the basic privilege of owning a pair of shoes. I not only own multiple pairs to take me through day to day living, but I’m privileged enough to own pairs of shoes to take me through all hobbies as well. Around the world, people are inhibited by their lack of shoe ownership. They are unable to walk to school, they are unprotected from environmental pathogens. They need this basic privilege that so many of us take advantage of. 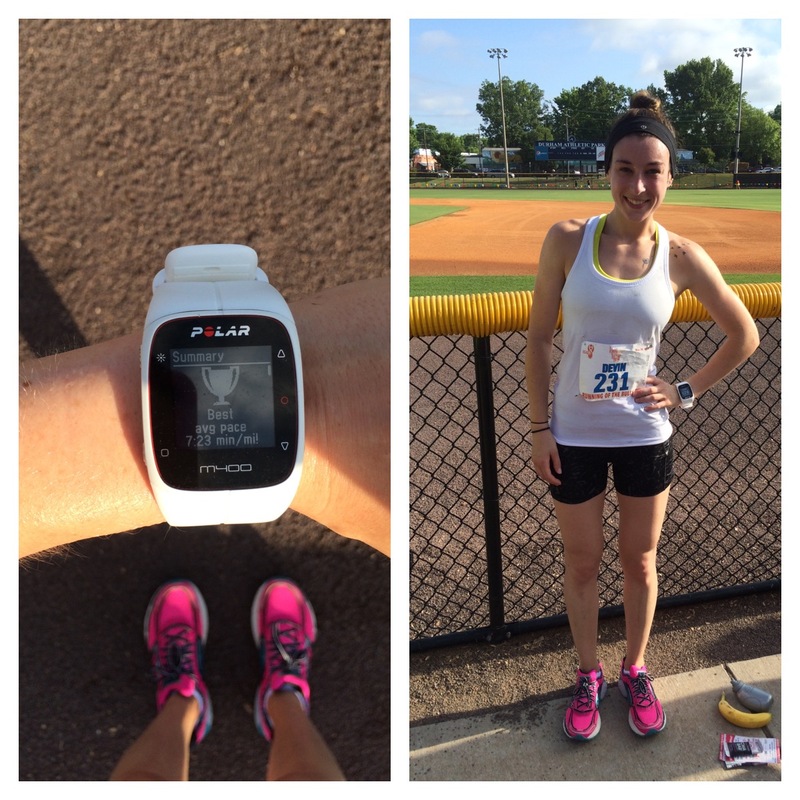 For each race I run, I am asking for a sponsor. However, I’m asking for a different kind of sponsor. This sponsor will donate a pair of shoes. These were the thoughts that then led to a Service Learning Project. Throughout the year, my students do research based on specific second grade social studies and science standards. Each quarter is filled with projects. They spend weeks asking questions, researching, collaborating, creating and educating each other on the different topics. This year, all of our projects will tie into Elephants and the Elephant-Human Relations Aid. 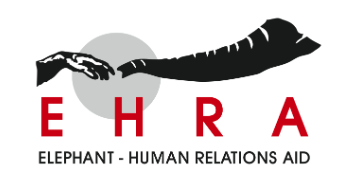 The EHRA is an organization that provides education and support in Namibia. They work to allow for peaceful coexistence between the elephants and civilians while also protecting the elephants from poaching and hunting. This organization has also done a lot of work in renovating local schools. These students are who we will be donating the shoes to. I’m a firm believer in the power of education (obviously…). Each race was already going to be dedicated to a group of students. To further their role in this project, students will also have a goal of obtaining a pair of shoes to donate. They will use their projects as a means to educate other classes as well as community members about elephants, the organization and why people should care about this cause. Even if they are unable to donate a pair of shoes, they will be playing a HUGE role: educating their community on such a major issue! So, not only will I be able to meet a personal, physical and mental goal, but I will also be guiding my students in understanding how they are global citizens who have the worlds most powerful tool to create change: education. Some details are still in the works, BUT if you are interested in being a sponsor for one of my races (aka donating a pair of children’s shoes) PLEASE contact me ASAP. The total number of shoes we need is in the ball park of 40. Shoe sizes will be known soon. But, please still let me know if are interested in donating once these details are confirmed. PS. I’m totally running every race in a elephant-ear headband. So far, this summer has been a somewhat mindless journey. While most people may see that as relaxing and carefree, I’ve found it to be a personal struggle. Since my routine has switched up, I’ve had to be more aware and focused on practicing presence and being in the moment. I’ve always been a big picture kind of person. I am able to create powerful visions, set my eyes on a goal and chase after it. However, this makes focusing on details a bit more of a challenge for me. And I realized, this is exactly whats been limiting my mindfulness this summer. Don’t get me wrong, I am absolutely surrounded by gratitude for my summer experiences. I am provided financial stability with my jobs and am given the opportunity to make connections in a city that is still new to me. But, while I am very aware of all I have to be thankful for this summer, I still couldn’t shake off this feeling of emptiness. When I looked at the big picture of this summer, I recognized I wasn’t in my norm, my comfort, my passion of teaching and was working to make financial ends meet. Of course I was surrounded by more negativity than normal. Who wouldn’t be with this kind of perspective on their day to day life? But, I was very aware that I was choosing to look at my life this way. To simplify the picture and create this less-than exciting narrative for myself. So, as I sat in the shower in this morning, I decided to meditate and let it go. The first thing I did was recognize the feeling I was surrounded by. And the best way I could describe it was empty. What may be empty for others may not match what I’m describing as empty, but for me and my journey, this word just seemed to fit. So, I was aware of this empty feeling and that I had to let it go, replace it with another emotion. I wanted to be surrounded by gratitude. How can I surround myself with gratitude? I started with a reflection of my day so far…all two hours of it. I got to start my day with a run. I’ve started to deem running as “meditation in motion” because that’s exactly what it is for me. I’m able to get lost in the moment as my body moves and pushes itself. So, that was one detail of the morning that surrounded me with gratitude. The next was new friends to run with. One friend who I would not have even met if I hadn’t been a part of the lululemon family this summer. This one detail of gratitude then spiraled into another and another. My change in schedule has allowed for me meet new people at the box, who go early in the morning, people who I may have rarely ever spent time with if I didn’t have the opportunity to coach early in the morning. I’ve been able to read books, so many books for pleasure these past few weeks. I’ve saved money on gas from traveling less by car and more on foot. I could enjoy a morning run midweek with friends because I didn’t have to be in a rush to get anywhere. I’ve been able to step foot on my mat multiple times a day, in different settings, in new studios. I took a deep breath and just like that, emptiness was replaced with gratitude. My big picture shifted from negative to positive as it was filled with details of love, compassion and excitement. And all I had to do was take the time to follow the cycle of mindfulness that I preach to my students day in and day out. The most challenging part was being reminded that I should not judge myself for being mindless. Each day is a new day, a new journey making us all beginners. By simply being aware of the mindless habits I was creating allowed me to be more mindful. 1. Mindful Thinking: be aware of the thoughts and emotions around you. Do not judge those thoughts and emotions. Just recognize their presence. 2. Mindful Speaking: say out loud what you will replace these thoughts and emotions with. Breathe in and breathe out. 3. Mindful Listening: listen to your body, to where you may feel tension, to the thoughts surrounding your mind. What are you becoming aware of as you work to replace those initial feelings? 4. Mindful Acting: Put it into action. Practice your replacement emotion. How you do it is up to you. And always remember to breathe. If you slip, do not judge yourself. Simply repeat steps 1 through 4. Cheers to mindfulness and the mindlessness that sparked the journey. If you haven’t been able to tell yet, my relationship with food has drastically changed over the years. Once upon a time, I was afraid of food and what it would do to my body. I ate foods that in my head wouldn’t make my 95 pound body “fat,” such as dry cereal. Lots and lots of dry cereal and other empty calories. I’m surrounded with gratitude knowing that I my relationship with food has greatly shifted. Whereas I was once fearful of the food entering my body, I am now aware of the powerful ways food serves me…mentally, physically and spiritually. For me, leading a balanced lifestyle means having a balanced body and a balanced mind. Nutrition plays a key role in this. I can’t have a balanced body if I don’t fuel my body properly. I can’t have a balanced mind if my relationship with food is skewed. My nutrition truly started to balance out when I started to track my macros. As an athlete, it was vital for me to figure out what served my body well. I was over being exhausted all the time. While I thought this was from being too busy (which part of it was), it was mainly do to the fact that the “healthy” food I was eating wasn’t serving my body. Often, when I bring up my newly, rejuvenating eating habits, many people respond with “Oh I don’t care about calories.” This was my problem, though. I was unaware of how I was underserving my body by not consuming enough calories. As soon as I increased my calories and properly proportioning the amount that came from carbohydrates, protein and fat…I noticed life changing shifts in my energy levels. Food is powerful. Now, I’m taking my relationship with food to the next level. My best friend and soul sister, Erin Frye, texted me one day with something along the lines “So, I decided I’m going to be vegan.” Being supportive (and slightly ignorant), I told her that was amazing and to make sure she was consuming enough protein. She passionately shared her journey into this lifestyle with me, so much so that I became intrigued. The idea of a plant based diet was not exactly new to me. Being a Health and Wellness major at UNCA, I was exposed to documentaries such as Forks Over Knives, and provided an overwhelming amount of information on the value of receiving nutrients from nature. So, I decided to educate myself. Erin recommended The Good Karma Diet. Let me start by saying, with just about every chapter I read came a thorough google search on the counter view points. My purpose in reading this book was to become aware, and think about what would mentally, physically and spiritually best serve my body. I knew that awareness of my macronutrients had served my body well and I wanted to continue that path. Would I be able to do so? I quickly learned my answer was yes. So here’s a mini break down of the book and why I believe its a must read, whether you want to adopt this life style or not. 1. You can make this lifestyle fit you. Victoria Moran does a phenomenal job on making it obvious that there are no rules and regulations you have to follow in order to begin your vegan journey. Perhaps you want to improve your health. Maybe you became aware of the treatment of animals and simply couldn’t stand behind the factory farm industry. Whatever your motivation, life happens, and any choice you make can have a powerful impact. 2. Just because it’s good for you, doesn’t mean its good for the animal. Over the past few years, I had always eaten “well.” Organic foods, local meat, cage free eggs etc; etc; Although the way food is handled may serve me, it does not necessarily serve the animal. Organic means the animal is not stuffed with hormones or other chemicals. This term has nothing to do with how crammed the animal is in it’s cage, being treated like furniture in a storage unit. Cage free means the animal is allotted x number of hours outside of their cages. It has nothing to do with the food their given, where they live, and whether or not their body parts are chopped off. Local is great for supporting your community, but again, does not necessarily mean the animals are treated top notch. Some people may say, but their just animals. And that’s okay! That is your opinion, your view of the matter. For me, though, I couldn’t see it like that. I had baby Pood laying with me and couldn’t fathom that the cows, chicken, lamb etc; were much different than my sweet pup. This was also very eye opening for me. I always assumed that because the food was good for me, it was good for the animal. You walk into places like Whole Foods and the Fresh Market, where they seem so food friendly, but in reality, their corporations trying to get ahead. 3. Nourishing yourself with nature. As I mentioned previously, my biggest concern when I began educating myself was being able to keep up my calories and macronutrient percentages. I quickly learned that I was highly misinformed about the ability to get carbohydrates, protein and fats from nature. The book has a plethora of chapters that discusses topics people often argue: protein intake, vitamin B12, amino acids etc; I quickly found that I’m easily able to keep my calorie intake up while serving my body with delicious foods. In fact, plant based proteins are proven to serve your body better compared to animal based proteins, which are linked to cancer cell growth and heart disease. 4. It’s not just about the food. Animal products come in many forms. The book provides a dose of information on other animal products and the companies that support the well-being of animals. From beauty and health products to clothes and household items, animal products are all around. The author does a phenomenal job of offering information and available alternatives. As I mentioned earlier, I began this book simply to educate myself. And, I did just that. I became aware of how the choices I made with my food were impacting my body, my community and the environment. Even if you don’t want to adopt the lifestyle, or you made multiple counter arguments to the points I made in this post, educate yourself. Like I said, with each chapter, came a thorough search on the other point of view. I weighed both the opinions and the facts and found that my heart and mind connected with the Good Karma Diet. Becoming aware of differing life styles is a part of being a member of our diverse world. There’s no shame in building an understanding of how and why other people live their lives the way they do. So cheers, to being physically, mentally and spiritually served by food! This girl is fueled by gluten and proud. I posted on Instagram the other day about about a CrossFit member’s shirt saying “Fueled by Gluten” and how I LOVED our conversation about food education in our society. A couple of people reached out to me asking my opinion on the subject, so I figured I’d blog about it! Going gluten free has become very trendy over the past few years. I myself tried it, and quickly discovered it wasn’t best for my body. Every body is different. Every body reacts differently to foods. Most people who go gluten free choose to do so because of the way their body reacts to gluten. So, well, they don’t really have a choice. I will be the first to admit that when I tried being gluten free…I didn’t know what the heck it even was! All I knew was my stomach had not been digesting well, and I had been reading that going gluten free can help your digestion. However, this is really only the case if you are allergic to gluten, or have a gluten intolerance. I had neither. I know based off of trial and error. Gluten is the protein found in wheat, barley and rye. If you are allergic or have an intolerance to gluten, it is because your immune system has physically damaging reactions to gluten. When I tried going gluten free, I did not see any difference in the quality of my digestion, bloating or fatigue. This is because I do not have an intolerance to gluten. A gluten free diet is not healthiest for my body. What helped me fight off fatigue, bloating and poor digestion? Balanced eating. I was fatigued because I did not consume enough calories. I was bloated because I did not eat enough protein. My digestion was off because I was not balancing out the percentages of carbohydrates, proteins and fats that suite my body. What has worked best for me on this journey to leading a more mindful life, is I’ve stopped placing food into categories: good vs. bad, healthy vs. unhealthy. I educate myself. I read nutrition labels. I’m aware of where my food comes from, and how my body reacts to it. We are so easily convinced that physically cutting foods or calories will make us healthier, when in reality it makes us obsessed mentally, and unaware of our bodies true needs. So, I’m fueled by gluten and proud. Because my body needs the protein and reacts a-okay to it. But, please please PLEASE do your own research. I believe the best practice is to stop listening to the fads, following the trends and to grow in your personal awareness. This is what works best for me. Now, go discover what works best for you. Today, I set an intention of being present. While I strive to find presence in each day, I was extra aware of it today. Simply for the fact that this is my last week with my students. As a teacher, I have many first days, first weeks, last days and last weeks in my future. It was this time last year I had my very first last week of teaching, last day of teaching. This year, though, is different. This year has been special. I swore off teaching at my first year. After living 10 months of constant stress, an overly ambitious and eager attitude, I knew I couldn’t live the next 10, 20, 30+ years like this. If this was teaching, I thought, I did not want to be a teacher. So, I took a leap, changed paths, and created my own happiness. Little did I know that my journey would lead me right back into the classroom. My second year of teaching has been completely different. What changed exactly? Me. I changed my attitude. I created new habits. I shifted my perspective. Teaching was no longer this exhausting career because I made choices that kept me balanced. And it all started on my mat. Yoga became my escape during my first year of teaching. The heat, the mantras, chanting ohm. I loved it all. What started as my escape soon became my home. When I step foot on my mat, I become grounded. I become reminded of the power within myself. The power I have to create a greater balance, a greater good. I look back and am amazed at the mental and physical transformation I’ve had on my mat. The struggle was real when I would attempt downward dog. My tight muscles matched perfectly with my tight mind. But, overtime, it all lightened and loosened up. As I reflect on my journey over the past two years, I am surrounded with gratitude for the growth and the experiences. However, everyday is a new day. We will always be newbies, beginners in this life of ours. I want a part of each day, of each journey to be spent on my mat; to be grounded by Split Pea. There’s no time like the present to practice presence. So, join in me #onmymat365. Get on your mat once a day, every day to find the bliss, the gratitude, the happiness in your journey. Shout out to my forever friend Erin who helped get me started on my yoga, soul searching journey.